On January 15 Rev. Elias Kitoi Nassari became Bishop of Meru Diocese of the Evangelical Lutheran Church in Tanzania (ELCT) following the footsteps of Bishop Dr Paulo Akyoo who retired after serving for 24 since the Diocese was established in 1993. Bishop Elias Kitoi Nassari (holding the staff) following his installation to lead Meru Diocese. He is flanked by his wife Eliashukura and the ELCT Presiding Bishop Dr Fredrick Shoo. Born on 22 December 1953 at Mulala Village in Meru, became Assistant to the Bishop in Meru Diocese 1992  2003. He pursued his study in Theology from 1979 -1983 at the then Makumira University College before being ordained to become a pastor on 8 January 1984 and served in various parishes in Meru and Northern Dioceses. He became the District pastor of Meru while it was under Northern Diocese between 1988  1992 before moving to the United States for Masters of Divinity and Sacred Theology Masters 1993 -1996. Bishop Dr Paul Erickson from ELCA Greater Milwaukee Synod took part in the service because the Synod has a special relationship with the Diocese given that Bishop Nassari was a Missionary under the South-North Programme between ELCT and the Evangelical Lutheran Church in America from 2003  2005. And before he became Bishop he worked as pastor in the United States for ten years 2006 to 2016. 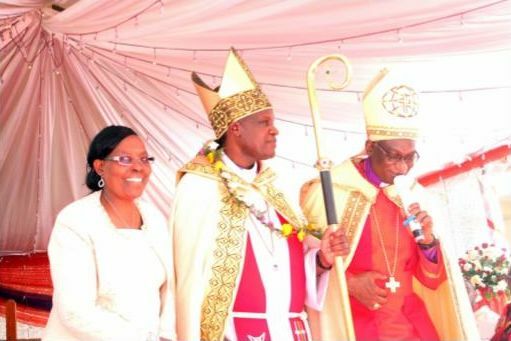 Bishop Nassari was consecrated at a Church service held at the Usa River Lutheran Cathedral and his installation to become the Bishop of Meru Diocese was led by the ELCT Presiding Bishop assisted by other Bishops from ELCT Dioceses. Apart from the presence of ELCT Bishops, the ceremony was graced by the presence of Government and political party dignitaries, invited guests representing partner churches and mission organizations and hundreds of members of the congregation.